Finally – Your staff should do what they do best – engage with patients one-on-one, in person. The rest can be left to us. Some practice owners try to do too much. On the one hand, it makes sense to ‘do it all in house’, but on the other hand, some things are best delegated to specialists and outsourced teams, especially when this can save you money. 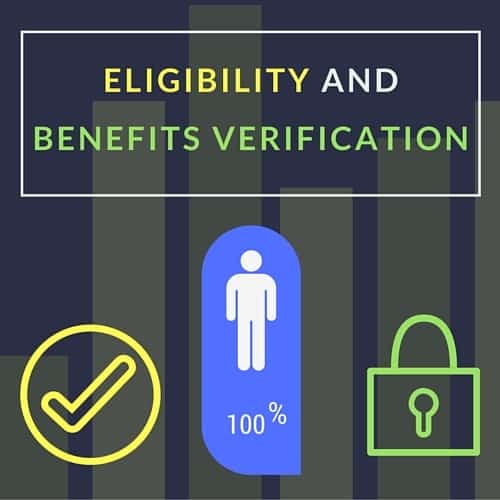 If your staff spends a significant amount of time, effort and money on verification of eligibility and benefits, then call us at 800-421-8442 or click here to schedule a call to learn more about the In Touch EMR eligibility and benefits verification service. In Touch EMR has an incredible service to take the entire task of eligibility and insurance verifications away from you, and make it our responsibility! It is essential that every healthcare practice, including physical therapy private practice owners, verify insurance eligibility and patient benefits before services are provided. This will prevent missed opportunities that result in lost income and claim denials. This will substantially reduce the workload and / or confusion at the front desk staff, since patient eligibility will be verified prior to check in. Not having accurate (and comprehensive) benefits information and pre-authorizations is THE number one reason for claim denials. Let’s face it – no one enjoys calling payers to verify benefits. It’s far more tempting to click a few buttons in web portals to get patient benefit verification data. However, this data is often incomplete, and a single mistake can cost you tens of thousands of dollars in claim denials. There are no shortcuts, and the only way to get the most accurate and reliable information is to ask a specific set of questions, and get a call reference number from the payer. Denial reasons include benefit caps, policy/coverage is no longer active, authorization denied, and denial for non-covered services. This results in payment rejections, and even permanent loss of income due to delayed or improper submission. Some clinics deal with this by having staff on the phone, for 30-45 minutes or more for each phone call, as they try to get answers from an insurance company. Others rely on technology for eligibility information online, but the information from online portals is not always accurate, and in most cases, incomplete. The good news – We present you with a new way that is cheaper, and more efficient. No need to call the payers. Focus on patient treatment and patient satisfaction. Get paid. We become an extension of your clinic. We call the payer, and get you the following in a secure, encrypted manner, mostly within 2-4 hours. Imagine a day in your clinic where every new patient had eligibility verification and pre-authorizations done and available to you, without a single member of your staff spending a minute on hold with an insurance company – all for a fraction of the cost of doing this in-house. Eligibility Verification is a powerful and effective service to combat claim denials for reasons such as ‘non-covered service’ and denials due to lack of eligibility and pre-authorizations. You’ll see lower denials and a happier, more productive staff. A happy practice makes more money. Our service includes a summary of communication with the payer and provides you with all relevant information – in many cases, before a patient walks into your clinic. We have a large team of specially trained callers who pick up the phone and call the appropriate insurance companies for every single patient and provide you with detailed information before you start treatment. The number one problem with claim denials – inaccurate benefits information and pre-authorizations is solved. Watch your claims get paid and your reimbursements skyrocket. It costs less to invest in our specially trained team to handle eligibility calls than to have your internal staff waste time on the phone. Your staff should be spending time on other important tasks to improve patient experience and grow your practice, not sitting on hold with an insurance company. You get current information about all patient benefits and can be assured that your claims won’t be denied due to eligibility or pre-authorization issues. Whether it takes us 5 minutes or 60, we’ll stay on the phone with the payer as long as needed to get you all the information to submit a clean claim and get paid. When you use our eligibility verification and pre-authorization service, you’ll save money, collect more from payers, and grow your practice. The cost is $8 per patient with a monthly minimum of 50 verifications / pre-authorizations. If this number is not reached, we will charge the minimum charge for 50 verifications, which is $400 for that month. No carry forward. If you see 5-8 new patients a week, you’ll easily reach the monthly minimum because you’ll do 5-8 verifications a week, plus additional verifications during re-evaluations / progress notes (highly recommended). You will also need pre-authorizations for many of your patients. Our pricing model is simple and transparent – no contracts and you can cancel anytime. If you pay a staff member $15/hr, and they spend 45 minutes getting eligibility information, entering this information into your EMR and filling out authorization forms, you’ve now invested about $10 into the eligibility verification for that patient, and you may still end up with incomplete / inaccurate information, which ends up costing you much more. We call the payer, and stay on hold for as long as it takes to get you the information you need. We know exactly whom to call, and what to ask. You’ll have the information the second we do. Payers regularly make policy changes without notifying you, and most patients don’t know their current policy benefits. Leave this to us. Month to month. No contracts. Keep us around if you’re happy. We use a 100% secure, encrypted HIPAA protected communication channel to send you all patient data. We verify all patient benefits & obtain pre-authorizations, so you can discuss payment options with patients before beginning treatment. The average staff member spends 10-15 minutes verifying eligibility and benefits information over the phone. Not only does this pull the staff member away from other, more critical tasks like patient callbacks and customer service, it costs you money. Let’s say the staff member’s salary is $15 an hour. A 45 minute phone call therefore, costs you almost $9-$12. This does not take into consideration the time the staff member spends waiting for responses, and filling out authorization forms. The In Touch EMR eligibility verification service solves all these problems at rates as low as $6 per verification. The end result – a happier front desk staff and lower claim denials. This service from In Touch EMR is a powerful and effective way to prevent claim denials for reasons such as ‘non-covered service’ and denials due to lack of eligibility. Imagine what a verification service like this can do for your practice. Effective patient engagement is the hallmark of a successful, rapidly growing private practice. Our live operators act as an extension of your clinic and will answer all patient questions about patient statements and outstanding bills. This will significantly reduce the administrative work of your front desk staff, and help your staff to focus on what matters the most – providing one-on-one attention to care to all your patients face-to-face. At In Touch Billing, we use a network of clinicians, physicians and attorneys in addition to our contacts with payers to make sure you get paid more, faster. Our team includes certified billers, coders and accounts receivable specialists. Every aspect of your claim, from scheduling to clinical documentation to claim submission and payment posting is monitored carefully from start to finish. Our services will help you save time, effort and money and allow you to do what you do best – focus on patient care. We specialize in workers compensation claims and NF billing of outpatient, inpatient, implant, and ambulatory surgery practices as well. In Touch Billing provides billing and coding services with a team of experienced, and dedicated billers and coders, certified by the American Academy of Professional Coders (AAPC). In Touch Billing has an average first pass rate 8% higher than industry standard, with costs averaging 2% lower. Schedule a discovery call today to get your no obligation billing quote from In Touch Billing. This no-obligations 10 minute call has helped thousands of practice owners across the country reduce costs, and increase monthly revenue.. and now it’s your turn. In addition to our eligibility verification service and our inbound patient calling service, In Touch EMR provides an integrated software suite, consisting of an EMR, scheduler and billing software, combined with a meticulous billing service. This allows your practice to save tens of thousands of dollars each year. Learn more in our no-obligations, no-pressure discovery call. You’ll see for yourself why In Touch Billing is a full-service billing company unlike anything you’ve ever seen.